Figs. 1, 2, 3, 4, 5. Amphibrachium spongiosum Lipman sp. nov.; x180. 2 - holotype, 1-5 - Tyumen reference bore hole 1-R, dept 514,90 m. Santonian-Campanian, lower radiolarian assemblage. Figs. 6, 7. Amphibrachium concentricum Lipman sp. nov.; x180. 6 - holotype, Tyumen reference bore hole 1-R, dept 530 m; 7 - dept 530 m. Santonian-Campanian, lower radiolarian assemblage. Figs. 8, 9. Amphibrachium mucronatum Lipman sp. nov.; x180. 8 - holotype, Vvedensk bore hole 5-K, dept 97,55-101,60 m; 9 - Synya River, outcrops. Santonian-Campanian, lower radiolarian assemblage. Figs. 10, 11, 12, 13. Amphibrachium ornatum Lipman sp. nov.; x180. 11 - holotype, Vvedensk bore hole 5-K, dept 97,55-101,60 m; 10 - Vvedensk bore hole 5-K, depth 97,55-101,60 m; 12, 13 – Synya River. Santonian-Campanian, lower radiolarian assemblage. Fig. 14. Amphimenium sibiricum Lipman sp. nov.; x180. Holotype, Synya River, outcrops. 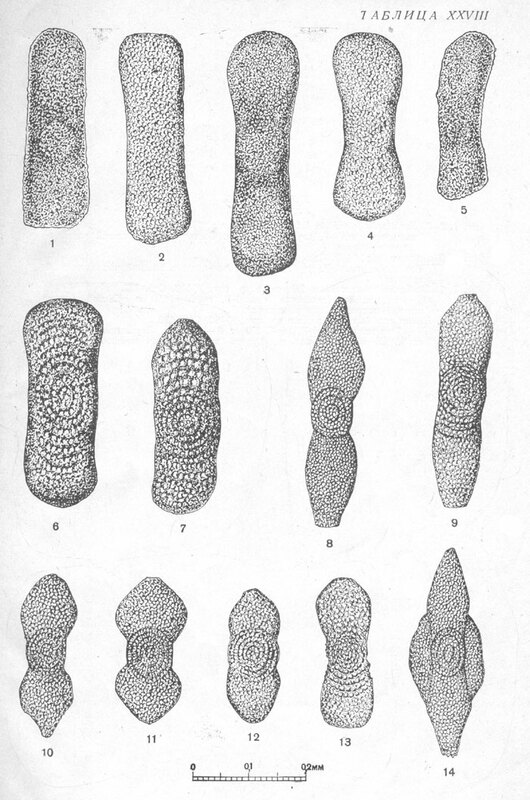 Santonian-Campanian, lower radiolarian assemblage.